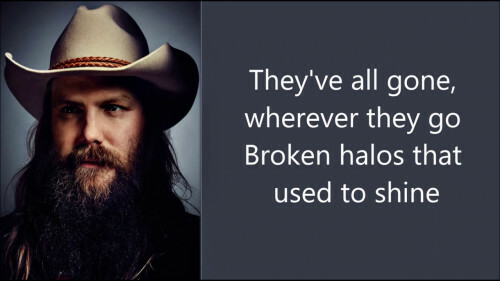 "Broken Halos" is a song recorded by American singer-songwriter Chris Stapleton. It was released on April 14, 2017 as a promotional single from his second studio album From A Room: Volume 1. Written by Stapleton and Mike Henderson, it is the lead track on the album. It was serviced to country radio on July 17 as the second single from the album. Broken Halos is a song about people close to us who pass away. At his concert at the Ryman Auditorium in February 2017, Stapleton introduced the song by noting that he wrote it on the day a childhood friend passed away from pancreatic cancer at the age of 37.